Higher profits at pub operator JD Wetherspoon could result in glasses being raised this week after the chain was given a lift by the summer heatwave. The sales boost, also driven by England’s successful run in the World Cup, has not yet been fully factored into City profit forecasts, said Douglas Jack at stockbroker Peel Hunt. Jack estimates profit in the year to the end of July was £108.1 million – ahead of the average City forecast of £105.5 million. He said at least a fifth of the 5.2 per cent increase in sales over the final three months of the chain’s year was due to sport and good weather. 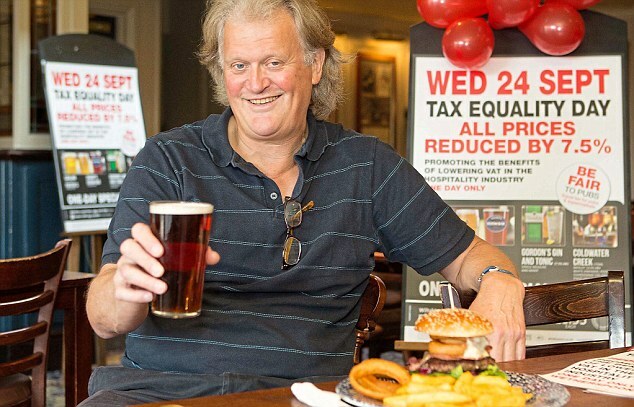 Wetherspoons, run by founder and chairman Tim Martin, has already announced it clocked up sales of £1.7 billion in the past year. But it faces rising costs on several fronts including staff wages, business rates and the sugar tax. The shares rose 3.4 per cent on Friday to 1244p after rival Greene King reported a World Cup boost. Jack said: ‘Wetherspoons are a good operator and in pretty good shape. They have a fairly unique proposition as the value destination for pub goers. Their brand is strong and their food range is good.